After quite a break from drawing- like months and months (see last post here)- there has been a recent resurgence towards drawing. A few new schemes have emerged: train bridges, sky, sun and grass. But overall most of the drawings have looks similar to what he was going a year ago. Of course, with the added sky at the top, grass at the bottom- there is some development of space. Daddy dug up his compass from hiking and let him play with it. He showed him how to align it to the North. And Kodi went everywhere aligning it to the North. We continue to talk about direction, and point out various compasses and weather vanes we saw in books or around gardens or town. 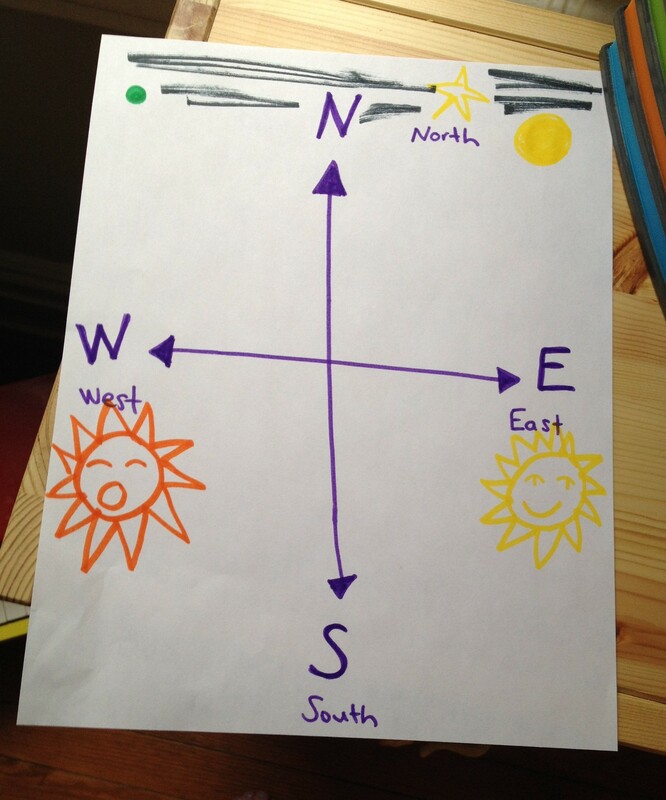 Once night at dinner as we talked about direction, I decided to draw a simple compass for him. As I drew it I talked about North, South, East, West. Then we talked about how the sun woke up in the East and went to bed in the West (of course further questions later arose about that, and it lead to me telling him that Asia was awake when we sleep and so on). He wanted me to add the Morning Star- something he learned about in school (in case you are like me and didn’t know this: a bright planet, especially Venus, when visible in the east before sunrise.). He wanted it on the left sky and green (technically should have been in the east with the rising sun, but he was telling me about the star so at this point we are going with his ideas for the drawing). Then he wanted me to add a star, a moon, and a full moon. Summary of the picture: Compass, Walking Suns- walking on grass, Morning Star, Sun coming up causing the black sky to turn blue. 3 years and 18 days. Brilliant! It is amazing how he continues the lesson and reinforces what he has learned and makes it his own.